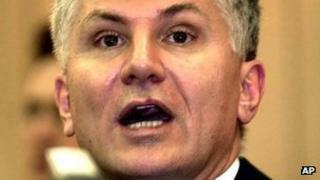 A court in Spain has approved the extradition of a man convicted of killing former Serbian Prime Minister Zoran Djindjic in 2003. Vladimir Milisavljevic was detained in Valencia last February, together with three other alleged members of a feared Serbian criminal gang, Zemun. He had been convicted in absentia in 2007 of conspiring to kill Mr Djindjic, who was shot by a sniper in March 2003. Milisavljevic has also been convicted of 14 other murders and two abductions. He was sentenced to 35 years in prison by a court in Serbia for the part he played in the assassination of the pro-Western prime minister. Eleven others were convicted at the same trial. Prosecutors argued that Mr Djindjic had been targeted because of his decision to send ex-Yugoslav President Slobodan Milosevic to be tried on war crimes charges in The Hague, and for his attempts to crack down on organised crime. The Zemun gang, in which Milisavljevic was allegedly a senior member, was born out of Arkan's Tigers, a Serbian paramilitary unit which gained a reputation for brutality during the conflict in the former Yugoslavia in the 1990s. Despite the assassination in 2000 of its leader, Arkan, the group is alleged to have become one of the most powerful organised criminal gangs in Serbia. Milisavljevic was detained along with the alleged gang leader, Luka Bojovic, and two others. The group were carrying guns and a large sum in cash. One of the four has already been extradited while the case against Bojovic is pending.